Excilent. Thank you for help me.again I will disturb u.
I’ve just followed your recipe without addition and alternation. It was just great in taste. 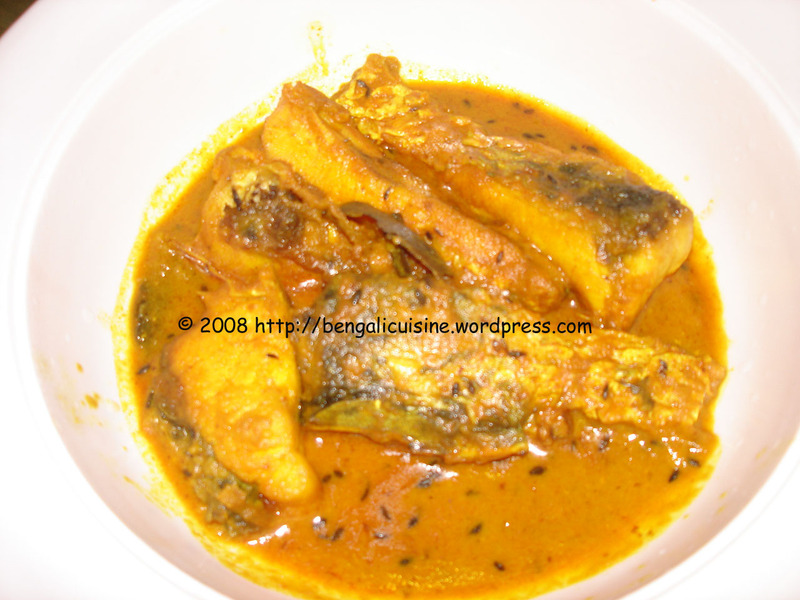 Ami prothom na fry kora fish eto bhalo khelam. Thanks for your recipe. My recipe:Heat mustard oil,put jeeraa(whole) and some crushed garam masala.Put grated onion and ginger and fry till golden brown.Now,remove the pan from heat and add whipped curd…(It prevents the yoghurt from curdling).saute.add chopped green chillies,salt and sugar.Now add the pieces of fried fish.Add some water if needed. (I did a small experiment by adding a bit of milk to give it a creamier texture).saute.drizzle some more garam masala and a bit of ghee for flavour.Serve with steamed basmati rice. I have noticed in almost all rui mach preparation v dont garlic…does it taste bad if I add…. Tripti you can add garlic to rui maach. But, I generally skip it because of two reasons – garlic has a pungent flavor and it subdues the other flavors; also it makes the gravy very rich. Addition of curd renders it sour for dinner, if you prepared it for lunch(we generally have to manage without refrigeration.heating helps or not, idk-never tried.sounds wired but many bachelors follow the practice.don’t worry heating it at or above 100°C or above, bringing it to a boil and letting it bill vigorously for a minute or two will make it practically 100% safe. Thanks a lot dear unknown unknown, its really helpful for me! I am a new cook. Sob mach gulo bhenge geche while frying…. GREAT DISH AND THANKS A LOT U GUYS ROCK. just one query do you put any kind of phoron in it, i mean jeera, whole garam masala or paanch phoron? As such I don’t put any phoron. Jeera is used during the preparationa nd if you wish you can put in little garam masala just before taking it out of the flame. Thank you for posting this recipe! My mom and I have a question. How do you prevent the yogurt from curdling in the pan (when using your “Alternative” recipe)? We would appreciate hearing your thoughts. Thanks! Thanks for visiting. I hope the doi rui turns out great from your kitchen.